BayStar hydraulic steering is brought to you by the manufacturers of SeaStar®, the most trusted name in pleasure boat steering. 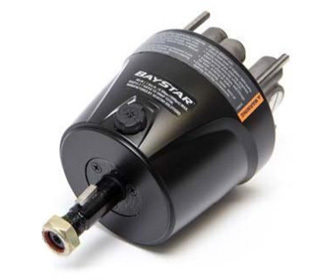 BayStar allows you to install all of the safety, reliability and comfort of hydraulic steering onto your boats rated to a MAXIMUM of 150 HP (total). Combine this with a superior design rigid ISO quality control and the finest materials and precision manufacturing—BayStar continues the tradition bringing comfort and safety to boating. HELM DESCRIPTION HELM PART NO. SEAL KIT PART NO. BayStar Plus Helms offer superior overall performance to BayStar due to an enhanced internal design.